Do you want to become a more strategic and vital partner to the business? Let Harjeet Kohli explain how. Harjeet Kohli has been incredibly busy and successful over the past couple of years. 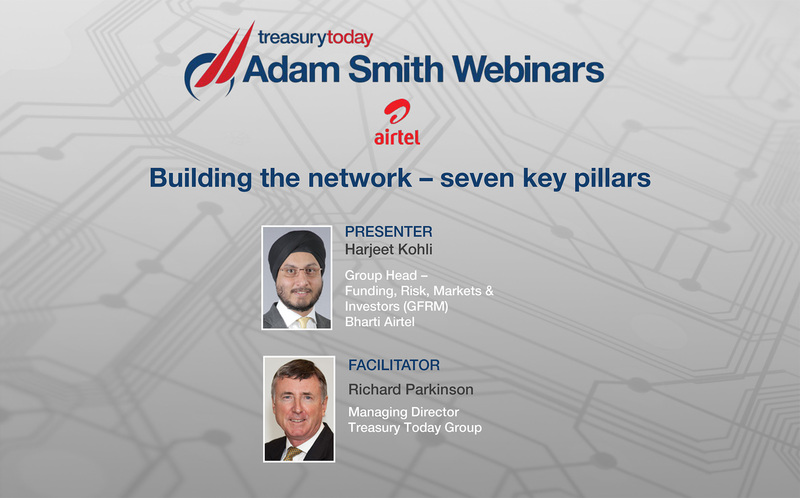 The GFRM team at Bharti Airtel, which he leads, has collected no fewer than four Adam Smith Awards, including Overall Winner, Treasury Today Asia’s Top Treasury Team 2014 as well as a Highly Commended Winner in this same category in 2015. Harjeet was also the overall winner in 2015 in the First Class Relationship Management category for his approach to internal and external stakeholder management. In this webinar Harjeet will share his experiences from the many projects he and his team have been implementing. His GFRM team has delivered some impressive results through a major treasury transformation programme spanning seven key pillars of the treasury function – debt management, risk management, working capital management, ratings management, capital structure management, controls and compliance and policy and governance. This webinar will explain how he has achieved so much and how GFRM is now firmly established as a strategic partner to the business. This webinar was held on Wednesday 23rd March 2016. What percentage of your total debt has a natural hedge and what percentage of the remaining debt do you hedge? We are currently in a continuing exercise of deleveraging as well as re-adjusting the currency mix of our debt such that we have a larger proportion of debt in currencies of our operations, thus offering us a larger proportion of natural hedge on our debt. Also, some of the countries where we have operations in Francophone Africa wherein the local currency is pegged to euros and in DRC where USD is the functional currency of the country, we are able to get a natural hedge from the same. Moreover, Bharti Airtel has a board approved policy towards hedging its outstanding FX liabilities, and in addition to the same, the company also looks to build additional buffers to protect against steep currency depreciation. At any point of time, our outstanding exposures are at least 50% hedged. What are the main challenges you see for your treasury specifically in the retained Africa business over the next 2-3 years? On the second one, I know you mentioned funding but you may wish to elaborate on this and other issues. Airtel Africa has been a tremendous learning experience for us as a company, and especially for us as a treasury. As a business, we continue to see Airtel as an opportunity with good indicators to create growth. From the time of the acquisition of the African business in 2010, we have been able to build a strong treasury product architecture with on ground treasury managers in each operating country, benign long term facilities for our operating countries, ability to hedge currencies across exotic currencies in Africa and a simplified transaction banking architecture. At present, as treasury, some of the key challenges that we continue to see is the volatility in liquidity and rates of currencies in a couple of countries especially in the wake of the commodity sell off, however, such dynamism is something we have seen in the past as well and are well placed to efficaciously manage. We continue to seek ‘stretch solutions’ from our banks, both to manage price risk and liquidity risks of US dollar or foreign currency – eg reciprocal deposits, forex swap, index/basket hedges and prop positions on options.